Access: The papers are open for research. Information on literary rights available in the repository. Preferred Citation: Redpath Chautauqua Bureau Records, Special Collections Department, University of Iowa Libraries (Iowa City). Circuit or "tent" Chautauqua had its beginning in the lyceum movement, which started in Massachusetts as early as 1826, and in the Chautauqua assemblies held at Lake Chautauqua, New York, beginning in 1874. The purpose of the lyceum movement was self-improvement through lectures and discussions on literary, scientific, and moral topics. After the Civil War, commercial lyceum bureaus were founded; among them was the Redpath Lyceum Bureau of James C. Redpath in 1868. In 1901, Keith Vawter purchased a one-third interest in the Redpath Lyceum Bureau and became the Redpath booking agent in Chicago, later moving his headquarters and operations to Cedar Rapids, Iowa. In the summer of 1904, Vawter launched the first Chautauqua circuit with the assistance of Charles Horner. The Redpath Lyceum Bureau had offices in other American cities, including White Plains, New York; Columbus, Ohio; Chicago; and Kansas City, Missouri. Vawters territory was roughly Iowa, Minnesota, the Dakotas, Nebraska, and Missouri. Another Iowan and former Vawter employee, Harry P. Harrison, ran the Chicago office. 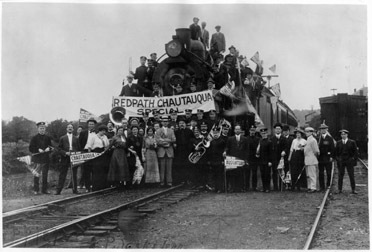 Under the name "Redpath-Chicago," Harrison launched a major Chautauqua circuit in 1912. His territory was Illinois, Indiana, Ohio, Michigan, Kentucky, Tennessee, and the Gulf States. In 1912, Horner established in Kansas City the "Redpath-Horner Chautauquas." His territory was Missouri, Arkansas, Texas, Oklahoma, Kansas, Nebraska, Wyoming, Colorado, and South Dakota. Circuit or tent Chautauqua began to expand and became an even greater influence about 1913, but World War I interrupted the circuits somewhat. In the years after the War (1920-1924), Chautauqua reached its peak of attendance. In 1920 there were twenty-one companies operating ninety-three circuits in the United States and Canada. The Great Depression brought an end to the circuits. The final circuit folded its tents in 1932 and the splendor of tent Chautauqua was over. The Redpath Chautauqua Bureau Records are comprised of approximately six hundred forty-eight linear feet of records primarily from the offices of the Redpath-Vawter Bureau of Cedar Rapids (Iowa), the Redpath-Chicago Bureau, and the Redpath-Kansas City (Missouri) Bureau. Other booking agencies are also represented in the collection, including the Associated Chautauquas of America, the Coit-Alber Chautauqua Company, the Ellison-White Chautauqua System, Loar International Chautauquas, and the Swarthmore Chautauqua Associations. Dating between 1890 and 1944 (bulk, 1904-1935), the collection is divided into series. Series I-IX encompass material received from the Redpath-Chicago Bureau. Series X-XIII contain items donated by various individuals. Music performed by individuals and groups is found in sheet music format. Agent and Employee records contain correspondence between the Chautauqua bureaus and people, usually other than talent, who worked for the bureaus. Business and financial records include Keith Vawters business records (1891 to 1931) and correspondence (1902 to 1936). The records from Harry Harrisons Redpath-Chicago office, during the same period, contain business correspondence, contracts, telegrams, etc. Charles Horners correspondence from the early years of circuit Chautauqua is part of this series as are agent and employee files. The Geographical location portion contains information about the towns which sponsored Chautauqua and lyceum programs. Arranged alphabetically, first by state and then by town, these folders include brochures, correspondence, and programs presented at that specific locale. Forty-seven states (excepting Alaska, Hawaii, and Wyoming) are represented; there are also folders for Canadian cities and towns. Ledgers containing schedules of performances by talent chronicle who was appearing where. Miscellaneous materials range from actual Chautauqua tickets to contracts, maps, books, etc. Theses and essays include papers written using the Redpath Chautauqua Collection. Journals and periodicals in the collection include partial sets of a number of periodicals including: The Lyceumite (1902-1907); Talent, a Magazine of Public Speaking (1890-1907); The Lyceumite and Talent (1907-1913), a merger of Talent and Lyceumite; Lyceum Magazine (1913-1922), which continued The Lyceumite and Talent; and The Lyceum News (1911-1922). The magazine files of the International Lyceum Association are also a part of this series. Some of the sets include the International Lyceum and Chautauqua Association Yearbooks (1911-1924); Lyceum Magazine and Leadership (1928-1929) a further continuation of The Lyceumite and Talent; The Platform World (1929-1933), a continuation of Lyceum Magazine and Talent; and Program (1933-1944). Articles, books, etc., that used the Redpath Chautauqua collection as a source of images, correspondence, brochures, etc., are located under Contemporary Uses. A number of related collections provide additional insight into what Chautauqua was all about. The Redpath Chautauqua Collection is the most extensive collection of circuit chautauqua and lyceum materials known to exist. The history of this collection is closely connected with the career of Harrison John Thornton, professor of history at the University of Iowa from 1929 to 1952. His scholarly interests in the lyceum and Chautauqua movements resulted in the Libraries original holdings. The Vawter estate left Keith Vawters personal papers to Professor Thornton, who willed the papers to the University Libraries upon his own death. The office files of the Redpath-Chicago Bureau were gifted to the University of Iowa Libraries in 1945, with the Libraries taking actual possession of the papers in 1951. Since that time the Libraries have continued to add to the collection, with several increments received in the 1970s. For more information about this collection see: McCown, Robert, "Records of the Redpath Collection," Books at Iowa, no. 19 ( November, 1973) and for further information on Chautauqua, Charlotte M. Canning's essay, "What was Chautauqua."